Since the election, an increase in concern for the looming "fiscal cliff" has been made apparent by the media, investors, and even Congress (it's about time). We have created a chart that is easy to understand and gives a concise explanation of what this so called cliff really is, along with speculative probabilities of fixing each component. Much of it is based on our White Paper about the fiscal cliff from earlier in the year. 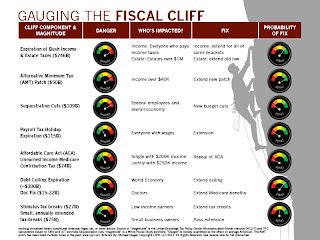 Click here to view Gauging the Fiscal Cliff on our site.